“Spiritual intelligence is inspired thought. It is light, the kiss of life that awakens our sleeping beauty. It animates people of any age, in any situation. In children, that quickening makes boys and girls want to seek out and cultivate their inborn gifts, energies, and desires. This book says let’s stay open to that kiss of life. Let’s trust in its existence. And more: I say that certain blessed children display such hunger for some sacred idea or truth burning within that they, or at least selected patterns of behavior, can be guides. The young can show us how to express our own spiritual truths. In a nutshell, that’s what this book is about. In the Book of Mark (12:34) we read that when a certain scribe revealed a deep inner knowing, Jesus of Nazareth said he was nearing the kingdom of God. That scribe was inspired. He had ‘spiritual intelligence,’ the heightened discernment that we often say generates supernatural qualities: intuition, a firm moral compass, power or inner authority, the ability to discern right from wrong, and wisdom. Some children are on fire with such traits, and each chapter explores these qualities. Much like the scribe deemed intelligent by Jesus, these children make contact with their intuitional depths sooner than others. …Why is this? This book is driven by that one question. 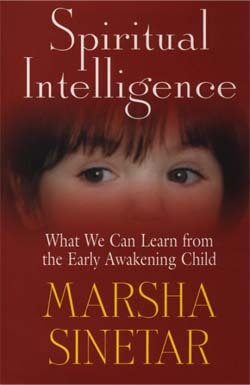 In other words, what attributes do children with high spiritual intelligence share? And how do these attributes influence adults?